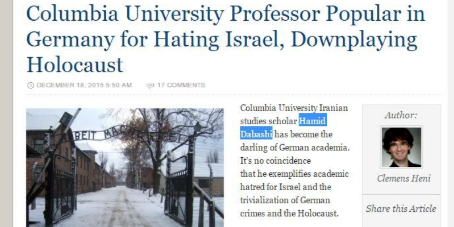 What would happen if a Jewish professor at Columbia University was spreading virulent hatred for Muslims as this Iranian professor at Columbia is spreading hatred for Jews everyday? A tenured Muslim Columbia University professor of Iranian studies, Hamid Dabashi, has called Jewish Americans “diehard Fifth Column Zionists,” and recently posted a tweet blaming Israel for “every dirty treacherous ugly and pernicious act happening in the world.” If this were an issue of anti-African American or anti-Muslim bias, Columbia would never ignore or whitewash such charges. 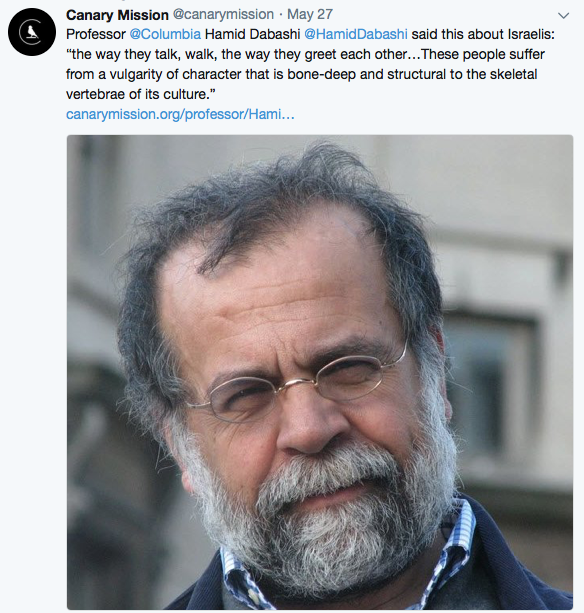 FOX News (h/t Marvin W) Hamid Dabashi, who also teaches comparative literature at the Ivy League school, blamed Israel for every “dirty” problem in the world, much as he has done nearly everyday he has been a professor at Columbia. In a Facebook post, he called the Jewish State a “racist apartheid state” and then attacked Israeli Prime Minister Benjamin Netanyahu. ACF Director Avi Gordon told Campus Reform that this is not a free speech issue, noting that the Columbia Students Supporting Israel chapter has made complaints about the professor creating a hostile environment for Pro-Israel and Jewish students in the past. Canary Mission “Blaming the Jewish state for every problem in the world is virulent anti-Semitism, echoing rhetoric that has led to oppression and violence against Jews for centuries,” Rena Nasar, a StandWithUs campus director, told Campus Reform. “Unfortunately, this is unsurprising coming from a professor with a long history of hatred against Jews and Israelis. Hamid Dabashi has spread conspiracy theories about Jewish influence in the U.S. and equated Israeli policies with Nazi Germany and ISIS. Dabashi has repeatedly propagated the anti-Semitic conspiracy theory that “rich and powerful” Zionists control American politics. On November 12, 2017, Dabashi posted a picture on his Facebook account of Jared Kushner and Ivanka Trump with the Crown Prince of Saudi Arabia Mohammed bin Salman. 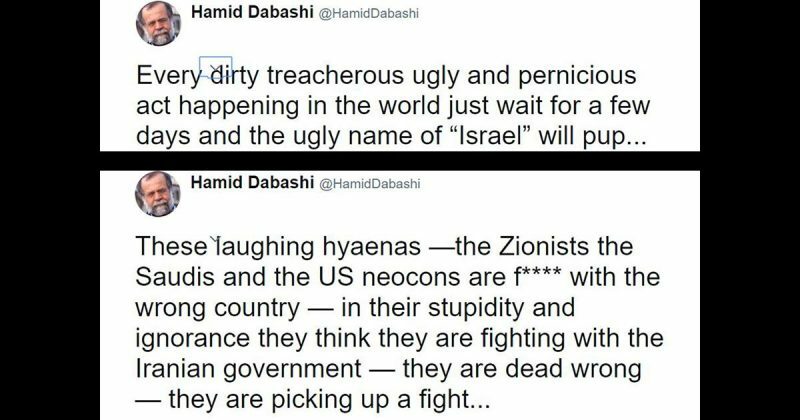 On February 15, 2015, Dabashi likened Israel to ISIS on Twitter. Dabashi has also accused Israel of committing an “incremental genocide“ of the Palestinian people, and has described Israel as “a military garrison that has stolen another people’s homeland at gunpoint and forced them into exile and refugee camps. Like the rest of Palestine, Jerusalem belongs to Palestinians”. Israel implemented OPE to destroy Hamas attack tunnels and stop rocket attacks from Gaza targeting Israeli civilians — that increased dramatically in the weeks prior to the Operation. In March of 2016, Dabashi signed a petition, created by a student initiative, to rebrand BDS at Columbia as: Columbia University Apartheid Divest (CUAD). here is what i do…i write to all these muz aholes and tell them off…i let them know there is ONE JEW out there who won’t take their crap…i even say: come and get me, coward..they never do….i then write to all the Jewish orgs and they are such pansies…they make me puke….Kahane< THEY ARE NOT!!! teaches Iranian studies. Formerly Iran was named Persia. In all of history, two of the greatest kings were Persian. King Cyrus and King Darius. They feared/revered the Holy One of Israel, our Glorious Creator. The Persian king who followed after them, was also like these two famous Persian kings, King Artaxerxes. King Darius issued this decree regarding the Jewish Temple on the Temple Mount in Jerusalem, Israel’s eternal capital. The Old Testament, the Word of God, is part of our Christian Bible. Bible, Old Testament, Ezra 6:12 May the God who has caused His name to dwell there overthrow any king or people who attempts to change it, so as to destroy this house of God in Jerusalem. I, Darius, have issued this decree, let it be carried out with all diligence! Every time I jokingly mention to my Jewish friend that he and his ilk are responsible for all the woes of the world, he comes back with “What the heck am I supposed to be doing now?”. And tweaker and the SPLC, Stupid Pandering Lying Creeps think this guy is way cool so we will give him a thumbs up and not say one mean thing about him. Iran was once Persia–a civilization of some note before it was conquered by primitive Arabs pushing Islam. Now they are more Arab and Muslim than the desert Arabs of Arabia. Here’s this guy being more rabidly fanatic about Islam than any Saudi Arab. These pseudo-Arabs have Persian ancestors that did a lot of conquering, who are now in favor of all those Arab and Muslim conquests of all of West Asia including Iran. Israel is just following the model of Spain in 1492 by rolling back a small portion of those violent Islamic conquests and land thefts through the ages. This pseudo-Arab must be quite unintelligent not to see all that. Ol dabased Dabashi is a good little devil worshiper. This is the kind of people who should be on the LIST, near the top, when the time comes. The first people to stand up & demand change are the Jews. They need to speak up! This is all hiding behind politics- anti Israel. In reality, it is anti Jewish. 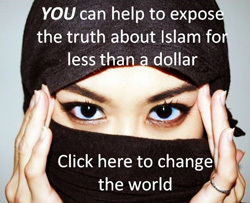 Mohammed taught his followers to hate Jews because they refused to convert to Islam. The hatred would be there with or without Israel. Az, hate to say it, but a majority of Jews (especially on college campuses) are leftists, which means they probably agree with the Iranian prof.
Fb ceo is jewish. How can he support muslims. Why? I don’t understand. George soros is jewish. How can he support muslims. Why? I don’t understand. 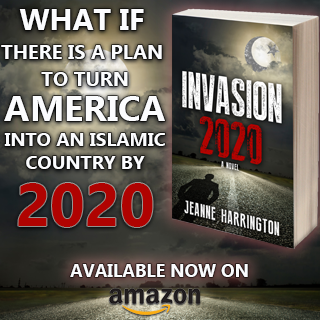 France rich politicians will soon feel the heat because, Muslim refugees are being house in rich areas of Paris currently. Why did politicians do it? 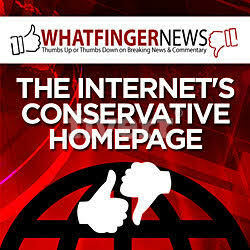 Uk, Germany, France, Sweden politicians are feeling the heat radiating on their own family i believe. Why ? Why did they do this? What is the grand scheme of bohemian society/illuminati? Win, please understand that these are Jews have abandoned Judaism (JINOS) in order to worship Leftism. Soros is an outright communist who wants to destroy Europe and eventually the US. He is well on the way by having already flooded the EU with muslim refugees. In America, not so much, now that Obama is gone. Obama was a Soros puppet and together they brought forth the Arab Spring, which was a failure. Calling this racist, manic, raving fanatic a professor is like calling Hitler a pacifist. He is incompetent and incompatible with what academia preaches (but by no means always practices). In a just world, he would be deemed unfit and stripped of his professorship. working as a pseudo academic. Simply put…. The Jewish professor wouldn’t be employed at the university! What can we do? Petition? Please let us know. A petition won’t do anything. 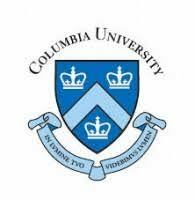 It’s the wealthy Jewish alumni who donate $millions to Columbia who need to threaten to stop giving them anything. But that is not likely to happen, because most are probably leftist Jews.